Download the latest hits from your favorite radio stations. Your music – free, legal & fast! Music-shop quality – but free! Audials offers you a massive selection of over 100,000 internet radios from all over the world ranging across all genres of music. Audials comes with the most popular English-language radios stations: 106.7 LITE FM, 181.FM, ABC, The Beat LA, BBC, Beatles Radio, Black Gospel Network, Radio Caraibes, Christian Pirate Radio, Fresh FM, Hard Radio, The JOY, KEXP 90.3, KIIS 102.7, Kiss FM, KNKX, KOST 103.5, KTU, Now FM, Onda Cero, Undergroundradio, VirtualDJ, Vision 2000, WAQX, WCBS-FM, WPLJ, WUCF 89.9, Z-100 and whole lot of other regional stations! You have a wish? Let Audials Radiotracker find you your music! In top quality! Faster and better than any other software! Simply select the hits, albums or entire discographies of your favourite artists. Audials then monitors every radio station in the world to find your favourite music: as soon as it finds that your song is being played somewhere, it records it for you. The Audials radio player shows you which songs are currently being played on each radio station before you even listen to them. The title preview in the live view even gives you an impressive overview of the album images as radio tiles. 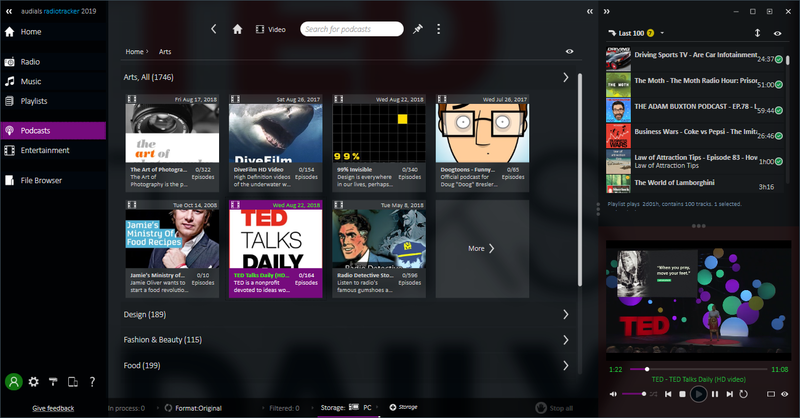 Choose your favourite stations or artists according to their various styles: You will always have direct access to your stations based on genre or mood. For each style, Audials will suggest more stations that fit to that style! You can listen to all your favourite stations on your PC, but of course also with the Audials app on your smartphone. Browse more than 350,000 podcasts with millions of episodes that you can watch, listen to, subscribe to and save to your favourites. Audials Radiotracker provides you with live advance information about the stations even before you start playing them! You can flick back and forth between the radio stations with single clicks. 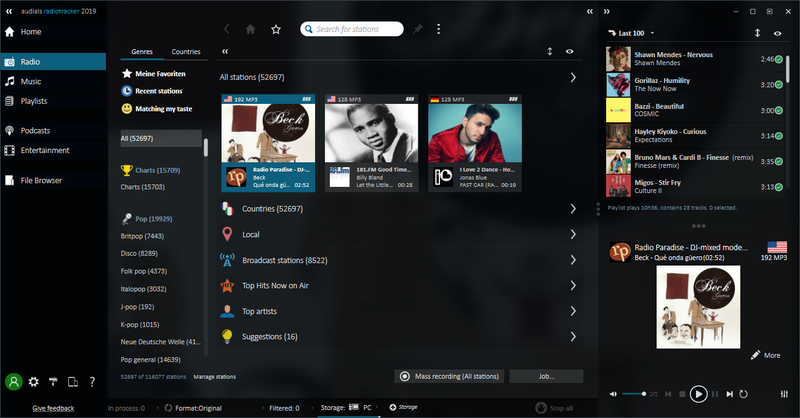 Using the Top Hits function, you can even switch directly to radio stations that are currently playing a top hit. Along with all the top 100,000 radio stations, Audials also provides you with the best international stations. You can browse through stations in the conventional way according to music genres, countries, languages or locality. Or alternatively, you can find suitable radio stations quickly by entering your favorite artist into the dynamic search function. Just click the album to get all the albums by your favorite stars. With just a single click, Audials Radiotracker rounds up all the tracks from a specific album. You can also select individual titles to record. Just choose a song, artist or album and click to get started. In no time flat, Audials fulfills all of your music wishes with ID3-tags, album artwork and lyrics and stuffs your hard drive full of music! Diamond Radio Stations only with Audials Radiotracker! The combination of the music wishes feature with limitation to music wishes from radio stations with diamond ratings is especially useful for users that only settle for high-quality recordings. Users that give Audials the necessary time to perform this function are rewarded with the highest possible recording quality. Audials Radiotracker entertains you non-stop in its own media player with loads of the best music TV stations. For every artist, the Audials music universe shows you similar artists and bands using photos. This means you can comfortably and simply browse through your own music in order to search for new similar music. Audials Radiotracker only displays the version of a song with the highest quality, while duplicates are kept off-screen in the background. This helps you to keep your music collection neatly organized without losing any tracks. You can still access the duplicates later if, for example, you feel a different version is best or if you wish to view all the duplicates. Finally, you can lump together all the duplicates in your collection and delete files individually or in bunches. Audials automatically completes your media collection with ID3-tags, album artwork and song lyrics, and does so during the recording process. Audials Radiotracker can also automatically equip imported songs with tags to make sure all of your tracks adhere to the Audials standard. 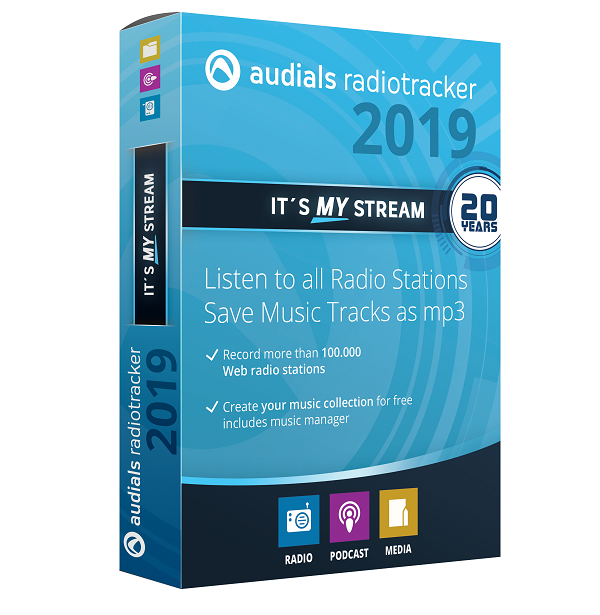 Audials Radiotracker fills up your smartphone or tablet either directly via USB cable or via the Internet from the cloud. 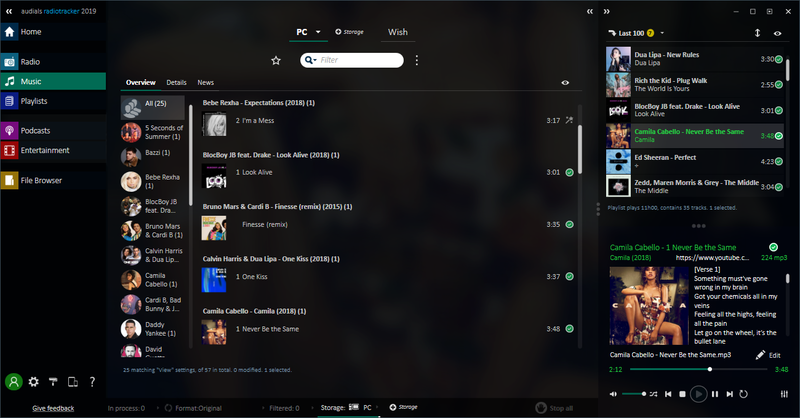 Using a right-left display, Audials shows the music collection on your PC and the target folder of your connected device. With the playlist generator, you can quickly and conveniently create playlists automatically. Simply enter in the genre or artist and Audials Radiotracker automatically creates a new playlist with matching music. 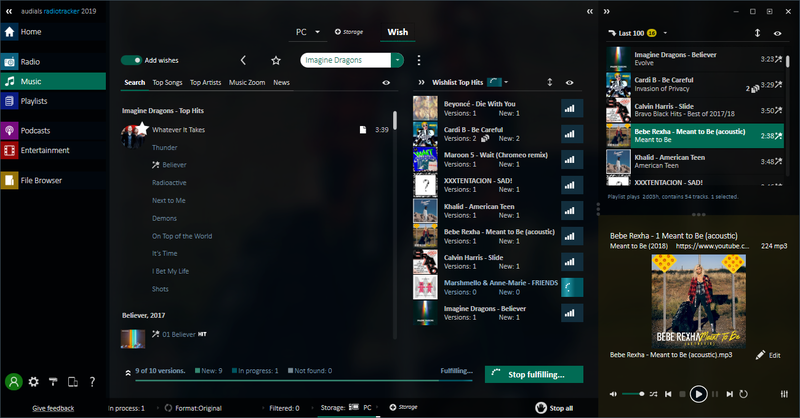 Or go about it manually and drag and drop tracks from your music collection into a list and make your own customized playlist.